Students across the country showed their support of guns on campus by wearing empty holsters earlier this month in an annual event aptly called “The Empty Holster Protest.” About 20 students at East Carolina University joined the movement. It didn’t take hold here at Carolina, but UNC senior Brandon Blalock has participated in years past. Brandon acquits himself very well. Of course, the drunken frat boy with a gun meme rears its ugly head, in this case from the mouth of UNC’s Department of Public Safety spokesman, Randy Young. He says the required permit training isn’t enough to qualify someone to handle a high-stress situation with a gunman. Under state law, you have to be 21 and have a thorough background check to get a concealed carry permit. But a current house bill would loosen those requirements, taking out the provision that a person must be mentally sound and not a felon. Since what the law actually does is remove the “physical or mental infirmity” part of the law that offers the Sheriff some wiggle room to make adverse judgement against you. The actual standard in Federal Law for gun ownership is “Mentally Incompetent.” As for removing the felon part, if you are a felon, you cannot touch a gun under Federal law. Getting a permit to carry something you can’t own is pretty much not an issue. The best part of this story is that it was a radio broadcast at UNC’s campus radio. You can listen to the broadcast by clicking here. But current North Carolina laws prevent Brandon and anyone else from having a gun on university property – permit or not. Send them a letter to the editor. Let them know what you think. Be fair, though. They didn’t even have to run the story, and they could have been horribly biased. The first duty of any government is to maintain order. Peaceful demonstrations are fine, but mob rule is incompatible with civilization. Any government that cannot maintain order deserves to fall, and will. Napoleon had his faults–well, to be blunt, he was crazy as a loon–but he had the right prescription for dealing with mobs: a whiff of grapeshot. Chairman of Police Federation Ian McKeever has warned that many police officers who are assigned to patrol the protest marches are feeling a lot of sympathy with protesters as they are faced with thousands of redundancies [layoffs, ed.] and £500 million in pay cuts. This is the end of the government. Full stop. Do not pass go, do not collect $200. The purpose of a police force is to enforce enough order to convince the majority of the population that the government is living up to its end of the social contract. The social contract that we have with our government is that we will give up our right for private vengeance for public justice. The shift from weregild or private revenge to punishment by the state no doubt represents an important social advance. But it ought to be thought of as a bargain, with the state standing in for the Lord and saying to the victim and his family, “Vengeance is mine; I will repay.” That bargain, once made, must be kept. Otherwise we have the opening scene of The Godfather, where the undertaker goes to Don Corleone for the vengeance the state has failed to provide. We have given up private vengeance, now the government has to provide public justice. What the ordinary Brits are facing is the realization that they have given up much more than private vengeance. They’ve given up self defense. They’ve given up any semblance of personal and property security. And yet still, the government has not provided them public justice. If the police forces will not end the rioting, and if indeed they are in sympathy with “anarchists” protesting the withering away of the state, then what prevents the ordinary citizens from deciding that their social contract has been broken and they should no longer be bound by it? What stops counter-mobs from sweeping down on the “anarchists” and slaughtering them? What prevents mobs of angry Brits from seizing suspected criminals and lynching them? Most importantly, what prevents angry mobs of Brits from seizing the politicians who built this untenable state of affairs and hanging them from any convenient sturdy structure? That’s the thing to remember. Once the people decide that there’s no benefit any more to pretending that the social contract binds them they won’t stop until they are either dead or enslaved, or all their enemies are dead. Here in America, the police aren’t that much better armed than the ordinary people. It’d be less hand to hand and more running gun battle. It’d be a mess. There never was an attempt to raise enough police forces to control the whole country. They only have enough people to keep the criminals well enough in check so that the screaming of the population doesn’t get too loud. They could not control an entire society out of control, nor even a significant portion that decides that the social contract is broken. If, as the police union leader in Wisconsin suggests, the police take the side of disorder even passively, it will get very ugly. Mobs cannot be allowed to trump actual voting. I would sincerely recommend that the people in leadership here and abroad decide if they really want to allow mobs to enforce their will on the rest of us. They may agree with the mobs, but will they agree with the backlash? More importantly, do they agree enough to willingly share the fate of the mob? Once we start fighting, we won’t stop until it’s over. Completely over. I’m willing to follow the laws when the laws are enforced fairly. I’m willing to vote when I’m confident that my vote will be counted and that the majority wins. I’m willing to be peaceful as long as the peace is kept by others. But if you give me no peace, unfair application of the laws, and my vote is nullified by an angry mob, why should I be peaceful? Why should anyone? So on Friday, the local branch of the National Education Association, the NC Association of Educators, held themselves a little protest rally. They dressed up in red t-shirts and marched around the Raleigh Convention Center. Nowhere near the NC General Assembly. On a Friday. When the Representatives and Senators were home. Let’s talk about this. 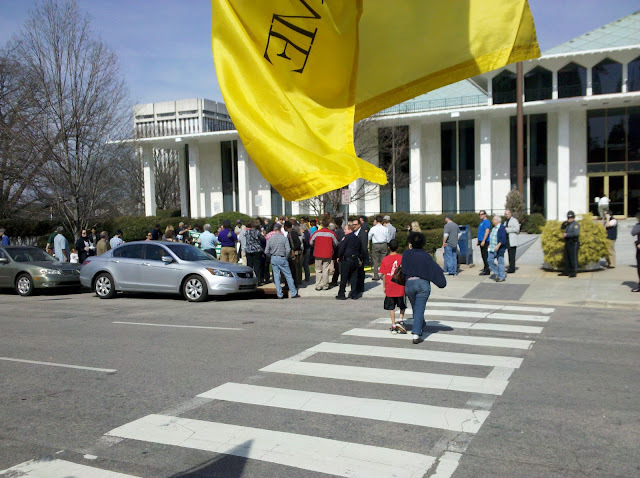 Who’s the idiot that thought that lobbying the NCGA on a Friday, in the wrong place, when they weren’t even in town made a whole lot of sense? This was a rally made for the cameras, and even the media wasn’t buying it. The teachers educators want you to know “how hard they work.” My answer has always been the same. It isn’t the effort that’s important. It’s the product. When you produce a crap product, you should get fired. And finally, who thought that having a drum and chanting circle, minus the drums, was a good idea? How many parents would be proud if their teacher educator was standing in a circle with other teachers educators clapping and chanting about “respect?” It doesn’t make me want to respect them. It makes me want to point and laugh. The TV news had to know that they were holding these teachers educators up to ridicule. In the end, I think that the only thing that will work is for the State to get out of the education industry entirely. I’ve got no problem with my tax dollars going to teach kids. I think that the best solution would be for each kid to get a set amount of money from the state government and be told to find a school that is acceptable. I don’t personally care if they take the money to the local public school, take it to a richy-rich private school, or mom teaches the kid at the dining room table. We need to stop viewing the school system as a jobs program for teachers. We need to start looking at how much money we are spending and deciding if we are getting our money’s worth. Judging by this piece of propaganda filmed by a Kannapolis high school, no, we aren’t. The Impact of Budget Cuts in Education from WNDR News on Vimeo. MoveOn.Org had a little meeting here in Garner, NC last night. They gathered 50 activists and would be activists for an apparent training session. I heard about it on a local blog and thought I’d show up. 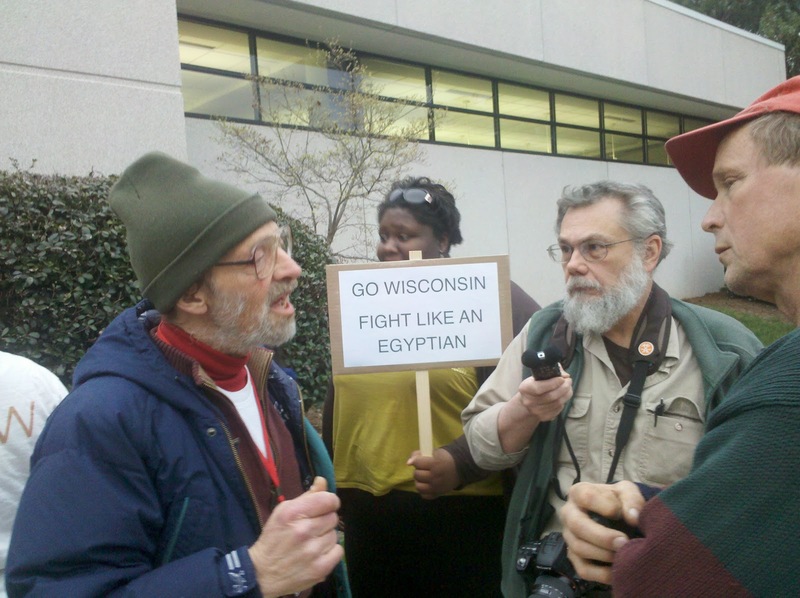 Here’s the photos of the activists that stayed outside the library with signs. I had to look up Art Pope. He’s apparently the Raleigh version of the Koch brothers. Note the big, friendly smile. Good for her. Just because you want to send gun toting government agents to rob rich people to satisfy your jealousy doesn’t mean you have to scowl at people. I wanted to ask this little girl what her sign meant, but I have a policy of not involving children in adult political discussions. It isn’t fair to ask them to defend their parents’ political beliefs. 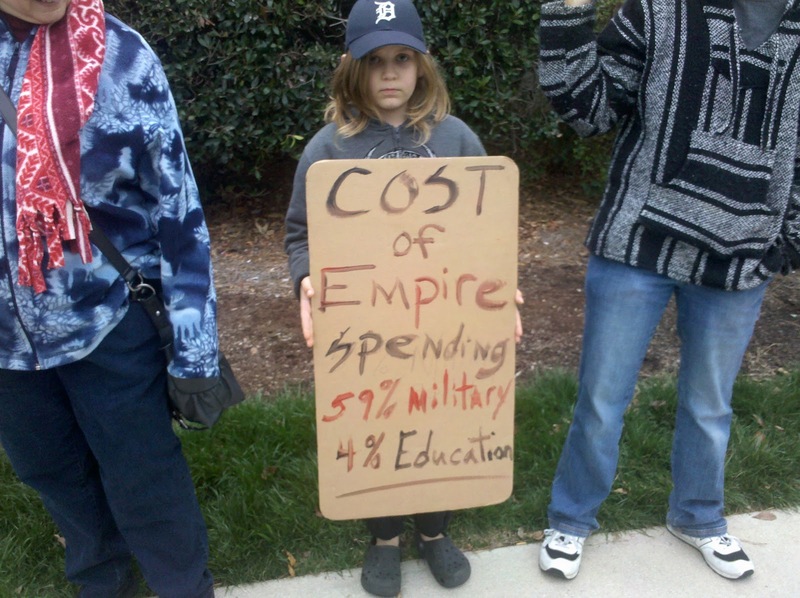 I did, however, look it up and military spending was 20% of the Federal budget for 2010. Education is a State and local issue, not a federal one. I thought that this sign was creative. Wrong and stupid, but creative. I met a few fun people, and will definately be going to more of these counterprotests. I even learned something. Apparently desiring a Federal government that is limited in its powers by the Constitution is incompatible with being a Christian. I’m not sure how it is incompatible, or why I am required to care even if it were true, but Hans and I were told that. 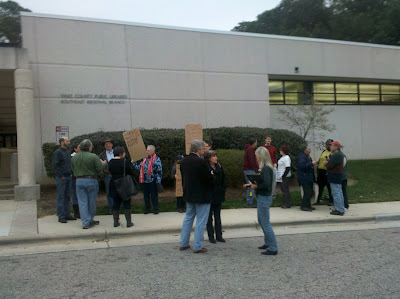 Another view of the dueling protests in Raleigh yesterday. Why do they keep referring to government employees as “public” workers? Why do they insist that government workers should get so much money and such great benefits? Nationally, government workers make double what private sector workers make. Do these people forget who their employers are? I’ve been having fun at these rallies. The people in the Tea Party ranks are a lot of fun to be around. If you get a chance, come out and join us. The State Employees Association of North Carolina (SEANC) and its parent group SEIU are scared. They are scared that they will lose all of their influence in this state forever. Before the last election, the Democrat party ran the show in North Carolina. Due to a century of gerrymandering, this increasingly Republican state has been held by the Democrats. Suddenly, the ground has shifted. After years of gains by Republicans, and two bad years under Obama and, to everyone’s surprise, both houses of the NC General Assembly have gone from Democrat to Republican control. No one saw this coming. There were hopes that the Senate might turn over, but no one dreamed that both houses would. While this has a profound effect on gun laws, as we are seeing, it will also have a critical effect on other laws in this state. Democrat leaders from gerrymandered far left districts were able to maintain control of committees in each chamber, killing reforms they didn’t like and advancing pet projects that might never get a hearing otherwise. Now, with Republicans in control of the committees, we have seen gun bills not only get voted out of committee, but they’ve been strengthened far beyond the weak compromise bills of previous years. The same things are going to happen to other laws in this state. SEANC and their SEIU overlords are scared that they will lose everything. There is almost no chance that a longstanding prohibition on collective bargaining for government workers will be repealed. There is equally little chance that NC’s Right to Work laws will be repealed. Workers in this state have long ago decided that, in most industries, there is no benefit to joining a union. In most cases, unions will take your money, negotiate contracts that you could have negotiated yourself, and then spend all your money getting Democrats elected. Realistically, the only way to increase union size is to force closed shops, card check, and to give government workers collective bargaining. That’s what this is all about. That’s why they are so angry. They want the power that comes from running a union. They want the State to collude with them in forcing you to join that union and have dues extracted from your paycheck. The protest you see in the video above is a manifestation of that fear and anger. Mark my words, it’ll get much worse as these people realize that their power isn’t coming back. You can see me taking a photo at the 56 second mark, right behind the woman in black. SEUI rally draws 100 people! A coalition of labor, civil rights and religious groups rallied in front of the General Assembly offices today to call for an end to North Carolina’s ban on public employees’ collective bargaining and to resist balancing the state budget at the expense of public sector jobs and programs. The rally drew about 100 supporters who listened to several speakers representing labor, churches and the NAACP, staff writer Craig Jarvis reports. About two dozen people staged a counter-protest across across the street in Bicentennial Plaza, shouting and chanting throughout the rally. Yeah, about 100 if you count the cops, media, and random passersby. Does this look like 100? 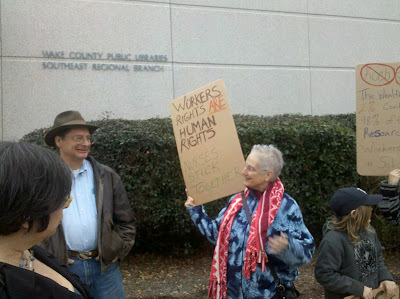 See my previous post on this SEIU rally. ﻿This is all that the SEIU and the NAACP could manage to organize for their lunch rally outside the NC General Assembly building today. 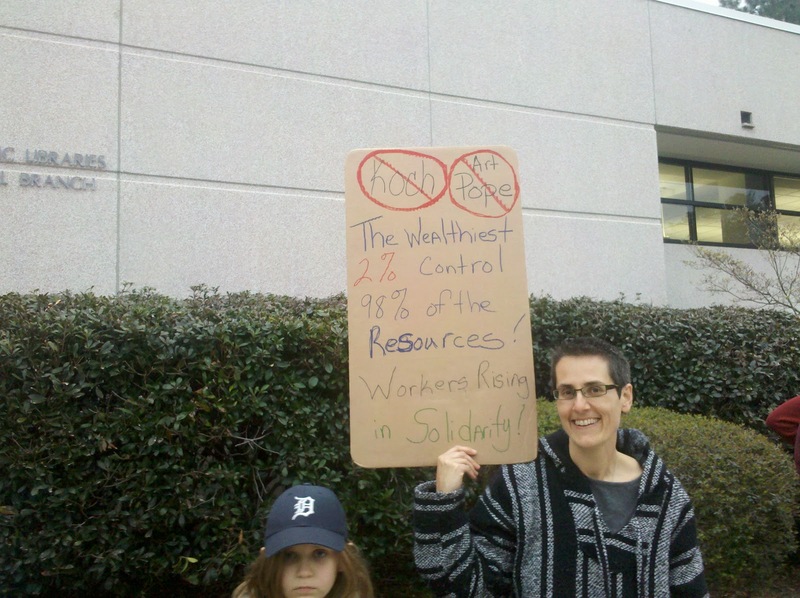 With all their money, you’d think that the SEIU could manage to bus in a few protestors. The counter protestors, many carrying handmade signs, American flags, or Gadsden flags, had about half as many people on the street as the actual protestors. The speakers went on at length about how “democracy” includes negotiating with the working man. Unfortunately for the SEIU, there was an election in November, and the Democrat party lost badly. Last I checked, when your party loses control of BOTH houses of the General Assembly for the first time since Reconstruction, it signals that you have lost the public argument. One of the things that they were most irritated about was the fact that State employees unions here in NC cannot collectively bargain, which is exactly the bone of contention in Wisconsin. I’m not sure exactly why the NAACP was there. You would think that the NAACP would be interested in the plight of black taxpayers, but once again, the NAACP has shown that the only thing they are interested in doing is supporting their liberal compatriots. It must be handy to have a group of blacks around who can be counted upon to call your political opponents racists. Basically that’s all they do anymore. What a sad conclusion for such a storied organization. I met quite a few nice people. It’s pretty clear that most of us don’t feel comfortable standing on a street corner hollering at our political opponents. Unlike the other side, we didn’t have organized cheers, and in fact, most of us didn’t yell at all. We did stop what chanting there was to pass out some info on a lost little girl. The State Capitol Police found her pretty quickly. I brought my dog, since the weather was fantastic, and she got a lot of petting. There were many television cameras there. Someone tried to hand me a microphone after the rally, but I declined. I will put up another post when the local TV stations post their videos. When the reporter tried to hand me the microphone, I was talking to a very nice lady who, when she found out that I was a gun blogger, wanted to ask me about getting a gun. She started off encouraging me to get more involved by coming to the Southern Wake Republican meeting. We ended up with me telling her about how silly NC gun laws were. We had two guys there with empty holsters. I explained how NC bans carrying a firearm at protest rallies. Several of the counterprotestors said that they heard about it from Michelle Malkin, the same place I read about it. We had people who had traveled from Asheville in the mountains and people who traveled from Beaufort County by the sea. That’s the left, bringing people together, though probably not the way they hoped. In the end, a lovely time was had by all. The weather was great, the people were nice, and the dog got petted. Too bad the SEIU looked so anemic.